…released 19 February 2012, the song reached No. 25 in the UK charts! 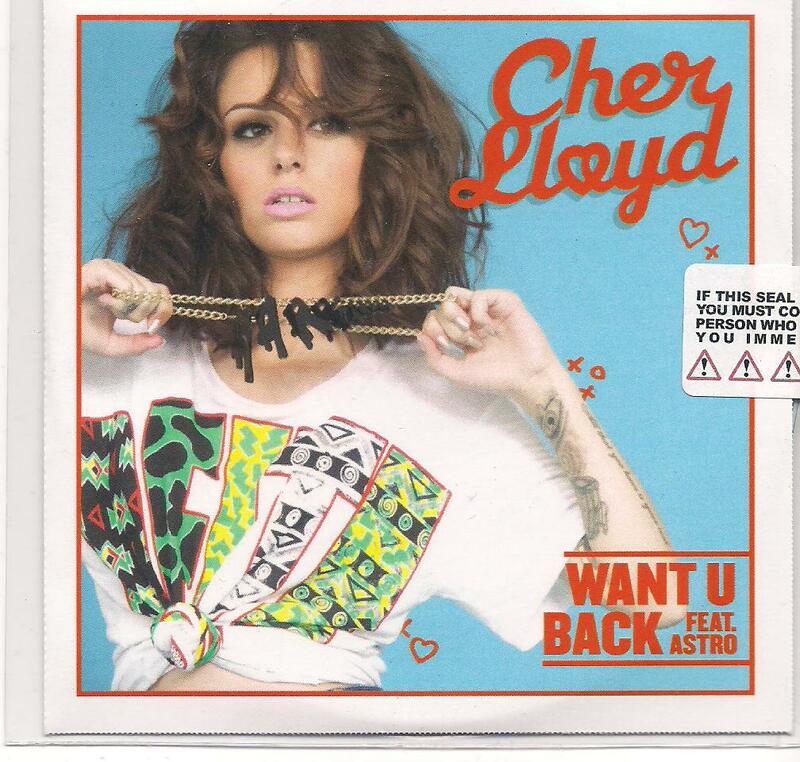 “Want U Back” was the 3rd UK single from Cher Lloyd, released in Feb 2012 and recruiting Astro from XFactor USA to add some guest vocals to the track. The song tells us of a girl whom having kissed her boy goodbye and walked away, is now wanting him back after spotting him around town with another girl. Perky, addictive – and from the opening “UHHN!” the track is loaded to the hilt with brattiness! And it’s that bratty attitude, which rather than just shine thru is glares thru blindingly – as if looking into the sun – that just makes me love the song so much! I think of all the releases from ‘Sticks + Stones’ and in fact, of all the tracks on the album, ‘Want U Back’ captures the brat element the best of them all ha ha ha! Musically, ‘Want U Back’ is an extremely catchy and sassy electr0-pop tune. Cher opens the track with a loud “UHHN!”, and the song begins with synths and drums combining to produce an incredibly lively bouncy infectious melody and beat. After a nonchalant throwaway ‘la la la-la la la laaa’ Cher sings “Hey Boy u never had much game, thought I needed to upgrade so I went and walked away away away…” and off she goes, leaving boyfriend in her wake. But before long however, Cher then discovers her ex has moved on to someone new but still doing all the things he used to do with her. Cher reminisces “Remember all the things that u and I did first? And now you’re doing them with her?” and realizes she is feeling like shh and wants her boyfriend back! The video for “Want U Back” is hilarious! In it, Cher looks amazing and as in the video for ‘With Ur Love’ has a much softer look than the urban style of the video for debut single ‘Swagger Jagger’. Cher wears her hair in a charming long loose wavy bob throughout the video and in the opening sequence in a cosy white knit with her lips and eyes pink, she sits on the bed looking at Polaroids of her and her ex. Cher then launches into some crazy schemes to demolish things between her ex and his new partner which include pouring water and popcorn all over them! When she does this Cher looks very cheeky, pulling faces ha ha! She wears a delightful short demin jacket with lace sleeves over a (™!) ♥ printed t, with a bold vertically striped black and white miniskirt and matching striped ankle boots. It’s a very youthful mischievous look and no doubt Cher had great fun filming the sabotage scenes! Elsewhere in the video Cher sings whilst wearing a simple ensemble of black tights and shorts and top itself topped with a cropped white top with spots of colour and lovely purple eyes and lips and a striking Grace DuPrez arrow necklace. Pops of colour are everywhere throughout the video to accompany perfectly the great colourful bubblegum pop song that is “Want U Back”! The video is very funny and simply fab! Available with ‘Want U Back’ were 4 additional remixes & versions! First up is a radio edit which is a slightly shorter version of the lead track but without Astro – so is almost the ‘Sticks + Stones’ version – except for that is 3mins 34sec and this is 3 mins 33sec? Second up is an acoustic version of the song – which with all the electronic effects and studio treatment stripped away totally hi-lights just how fab Cher actually sings the song! …but it could be equalled! As Pete Phantom does exactly that with his treatment of the track as the final fifth take on ‘Want U Back’. Very trancey but leaning towards house this remix has the most delightful kick in when Cher’s voice goes galactic before it all comes back to earth with a tumbling sampled snare and a ‘boy you can say anything you wanna, I don’t give a shh no one else can have ya’! Ha ha! Both the Cahill and the Phantom remixes stand head and shoulders at the same height. Tremendous! ‘With Ur Love’ was written by Shellback, Max Miller, Savan Kotecha and Mike Posner. Produced by Shellback. I’m not sure where to pitch it’s UK only sales as these were later so completely eclipsed by it’s sales in the US and worldwide. These will be talked about later on so for now I’m gonna remain quiet on it. I guess, by March 2012, however, sales in the UK of ‘Want U Back’ must have been somewhere around the 10,000 mark? Remember all the things that u and I did first?